The first Tecno smartphone phone with Full view display 18:9 ratio has been launched , and its called the Tecno Camon CM. It comes with a 5.7 inches full view display, designed with a mediatek MT6737 1.3GHz Cortex-A53 processor,. The Tecno Camon CM runs a 2GB of RAM and 16GB inbuilt memory with supports for sDcard upto 128GB. 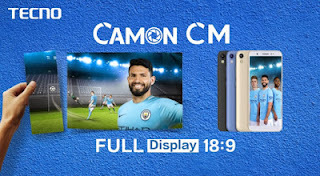 The Tecno Camon CM camera accompanies a 13MP front and 13MP back camera. Also run Android 7.0 nougat out of the box with Tecno own special Hios.